I am attending the College of Law Practice Management annual Futures Conference in Atlanta. The conference title this year is Running with the Machines – the entire conference is devoted to artificial intelligence (AI). This session is Hype vs. Reality: Is everything AI now?. The session description is appended at the end of the post. 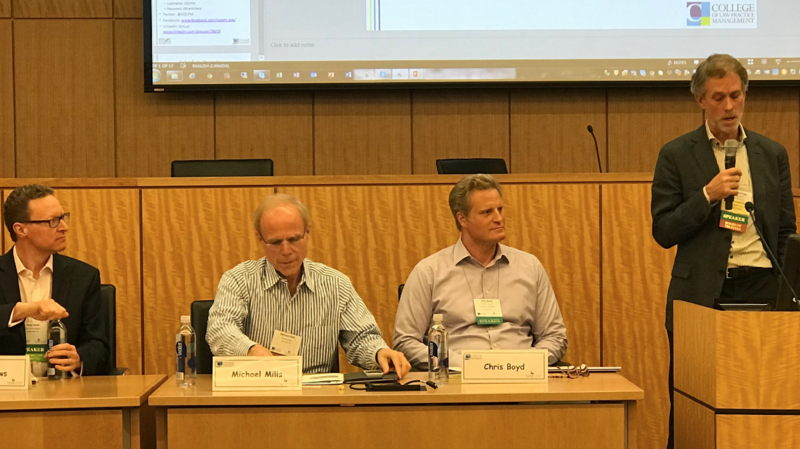 The panelists are Michael Mills, Co-Founder & Chief Strategy Officer, Neota Logic Inc.; Chris Boyd, Leader, attorney recruitment, KM and professional development, Wilson Sonsini Goodrich & Rosati; Andy Daws, Chief Customer Officer, Kim Technologies. This is a live blog. As with all my live blog posts, I publish as a session ends. So please forgive typos and misunderstandings of meaning. Intro: AI in the News Today (DoNotPay): Chris Boyd kicks off with some real world examples of AI in legal. He cites a WSJ squibb from today that describes Joshua Browder’s DoNotPay app, started to fight parking tickets in London. Browder is trying to make the law free for everyone. Browder has expanded the chat service to airline issues, telemarketers, and other issues. Due Diligence (Chris Boyd): In an acquisition, lawyers need to review many contracts. Wrangling the contracts, assigning them for review, and report on them is time consuming. Today, Kira and competing products make this process much easier. WSGR is a Kira customer. Chris cites a 20 hours savings (from 30 to 10) to review 1000 contracts in a due diligence review. To find change-of-control clauses, Kira can reduce hours from 40 to 10. To find variations from standard templates, Kira drops time from 17 to 2 hours. Substantive Legal Advice (Michael Mills): Littler uses Neota Logic to deliver labor advice over the web through Compliance HR, a joint venture between Littler and Neota. Contract Process in a Law Department (Andy Daws): A seasoned legal operations function with mature processes, tool, team, and playbook sought a way to apply AAI to streamline contracting projects. Using KIM, they were able to focus on “configuration, not coding”. The system automatically triages contracts, routing them for appropriate action or to appropriate person. Options includes self-service on one end or a very senior lawyer on the other end. Dermatology: deep neural networks identify skin cancer / suspicious lesions. The machine input was 130,000 images classified by four very experienced dermatologist. This system now works with a smartphone system and works better then human doctors. Games: AlphaGo wins at Go, the most complex game. Implications… All of the above is about inference. Machines find patterns, at least where there is some pattern to find in a large enough dataset, then the software can draw inference on new data. Most AI systems assign a confidence rating to each inference it makes. Ideally, the system can explain why it reaches its conclusions. But this remains the holy grail of AI. One is logical. Others are statistical…. The statistical approach is driven by very heavy-duty, opaque, can complex math. Statistical inference can be based on unsupervised learning: the system groups (clusters) the data without human intervention. Or supervised learning: an external source, typically human, identify inputs by category (cancerous or not, responsive or not). Algorithms, with enough inputs, can mimic human decision making. Or reinforcement learning: self-train with rewards over time. Example: a system that was wired to an Atari game and reinforced winning strategies. Branches and Products: AI is not one thing. There are many products, many algorithms, and many approaches. Michael Mills shows a great diagram. (RF: uploading media to my blog temporarily broken ???? ) There are many options along the major branches: expertise automation, legal research, contract analytics, e-discovery, and analytics + prediction. Access to Justice: Multiple products help with A2J. Computing Power: The power of AI computing is rapidly rising, especially with specialized chipsets and the rise of cloud computing. Chris Boyd on Big Law Perspective: Large firms should embrace AI to deliver more value to current clients and to serve under- or un-served markets. Chris to focus on former. Market is stagnant (citing 2016 Altman Weil survey). Same survey found that firms with stronger financial performance used more technologies (not AI specific). So, how can firms use AI to deliver more value? WSGR focuses on the ACC Value Challenge, which drives lower costs, better outcomes, and higher predictability. One example is using Lex Machina to predict outcomes in IP matters. Use AI tools to match up past cases with financials to make predicting cost faster and easier. Andy Daws on NewLaw Perspective: AI is both a threat and opportunity for legal service providers. Alternative business models and process reengineering is not enough… continued tech investment necessary. Michael Mills on Client Perspective: GCs read what we read, they attend conferences we attend. They are experimenting with AI (eg, contract analytics, data analytics for outside counsel management, and self-help for their internal business clients). They are asking their law firms questions. GCs want to learn from firms that are on the leading edge of using AI, tech, and better ways of working. Boyd: Market is so competitive, we have to find ways to reduce fees. More and more, WSGR is charging fixed fees (or having to treat estimates as such). Hype vs. Reality: Is everything AI now? AI has caught fire in the media. Companies promise AI products. Experts say only 5% of the claims are true, but the percent is growing. AI broke out in legal in 2016 and that continued in 2017, with many firms adopting AI or experimenting with it (especially in larger firms). Presenters will separate hype from reality. • Michael Mills, Co-Founder & Chief Strategy Officer, Neota Logic Inc.